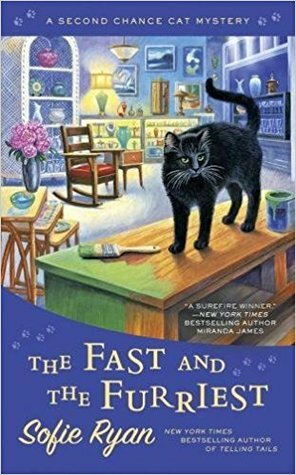 The Fast and the Furriest by Sofie Ryan is the fifth book from A Second Chance Cat Mystery series. In this book, someone from Mac's past shows up to see him and ends up meeting her maker. Sarah, her cat Elvis, along with Mr. P. and the Angels, must find the killer before Mac take the fall for the crime. I love this series. It's filled with fun characters and, of course, a cat who seems to know when people are lying. Sarah is a strong independent woman who stands on her own two feet. The Angels are friends of Sarah's grandmother. They also knew Sarah when she was little and came to stay with her grandmother in the summer. They work with Mr. P., a private investigator, who seems to get caught up in the cases of the community. They are a group of witty characters that add a wonderful quirkiness to the story. They made me laugh throughout the book. The mystery is a great who-dun-it. It grabbed me from the first page and kept me reading until the last. With it's twists and turns, it kept me guessing until the last page reveal. I definitely recommend this book to the cozy mystery reader that loves strong willed quirky characters, a story with lots of adventure, a touch of romance, with a plot that will draw you in and keep you turning its pages until the very end. I can definitely say this is one of my favorite series. If you haven't already, checkout the first four books in the series. You will not be disappointed.